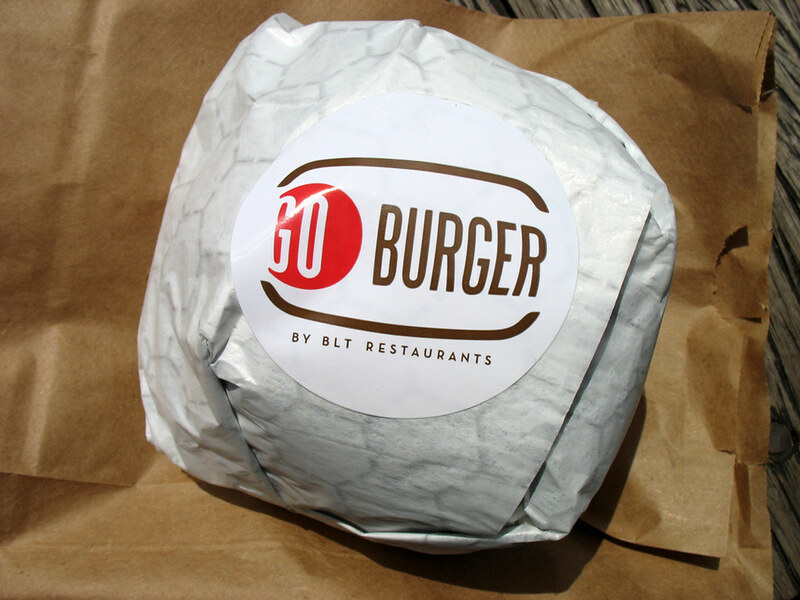 I didn’t realize the GO Burger truck served veggie burgers until I stumbled across the New York Street Food blog, and saw mention of it. According to GO Burger’s twitter feed, the veggie burger had been featured as one of their daily specials every day for the past month or so. 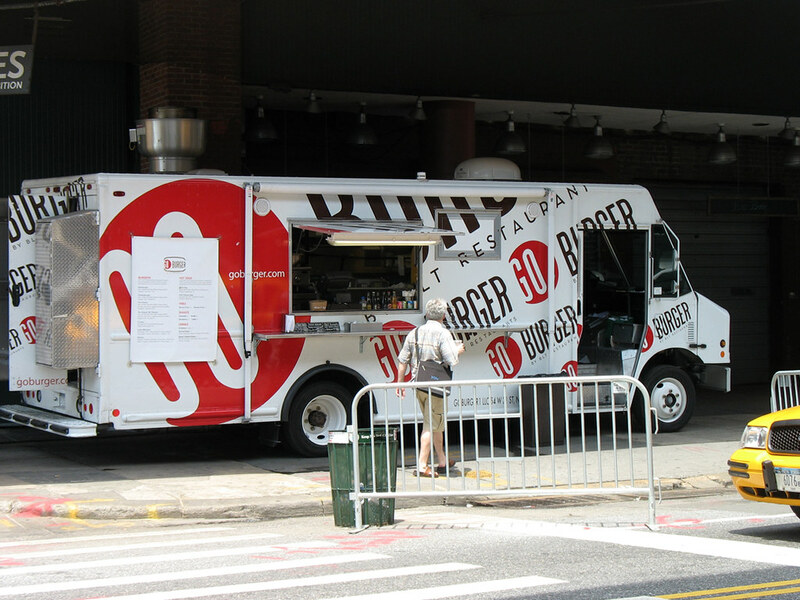 Since I had to pick up a lightsaber and run a few other errands, I thought I would stop by the South Street Seaport and see if I was lucky enough to catch the truck on a day when veggie burgers were still on the specials menu. Happily, I placed my order. One of the two guys working in the truck was especially friendly and talked with me while the other guy prepared my burger. I asked him why the veggie burger was only a special instead of being on the regular menu. He said that it actually was a regular menu item now – they are just waiting to get the new menu printed for the side of the truck. He also told me that the reason they started serving veggie burgers to begin with was because so many people had asked for them. Hear that? This is why it never hurts to ask! I told him how awesome I thought that was. They gave me my burger in a brown paper bag – I wasn’t hungry enough to order fries, but they do cost extra if you want them. 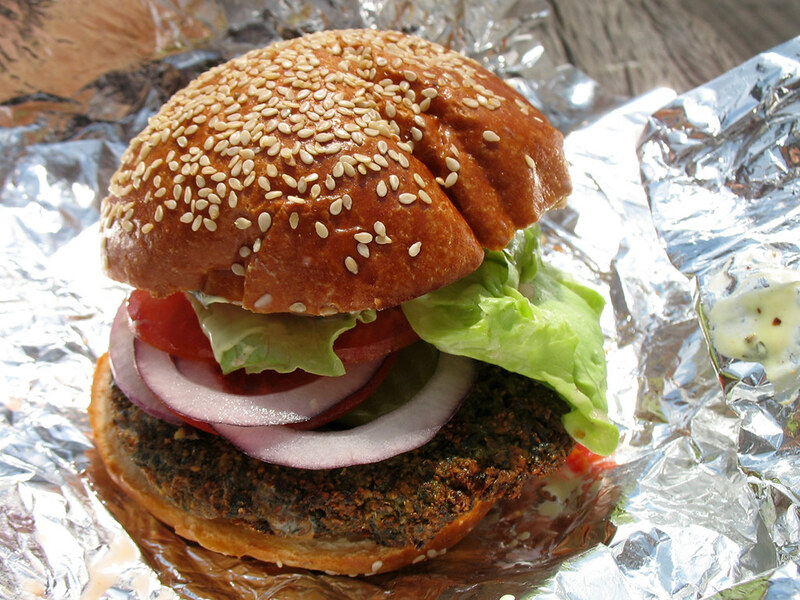 The burger is actually a falafel burger – the entire patty is like one large falafel ball, flattened, and sandwiched in a bun with toppings. The guys in the truck told me it was vegan. There was a creamy sauce on the inside of the bun when I unwrapped the whole thing, but it might have just been a tahini-based sauce. You should ask just to double check if you don’t/can’t eat dairy though. Toppings included lettuce, tomato, pickles, and a chopped assortment of onions and peppers in the sauce. It tasted pretty much like any falafel you would order from a street vendor in this city – only I think I prefer my falafel wrapped in a pita rather than a hamburger bun. I happen to love falafel, so I thought that overall it was a very tasty burger – but since it really was just falafel disguised as a burger, I think it’s more of a novelty enjoyment than something I would eat frequently, since I know I can get a regular falafel on any street corner, at a lower cost too. 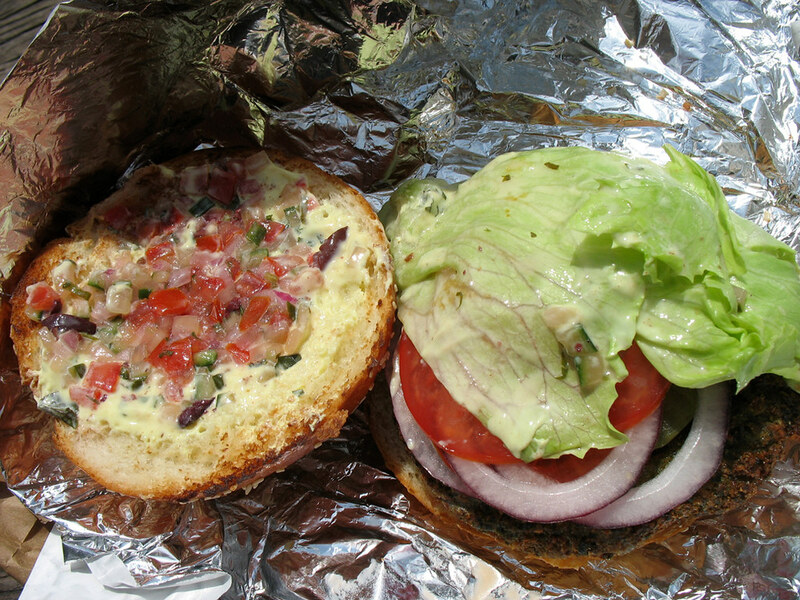 But as a novelty, it IS a fun one – I had a good time visiting the seaport again, and eating lunch out in the hot sun. And as far as I know, GO Burger is the only food truck in this city that serves veggie burgers… Does anyone know of any others? So I have to give them a lot of credit for that, and they seem like cool people who deserve it. 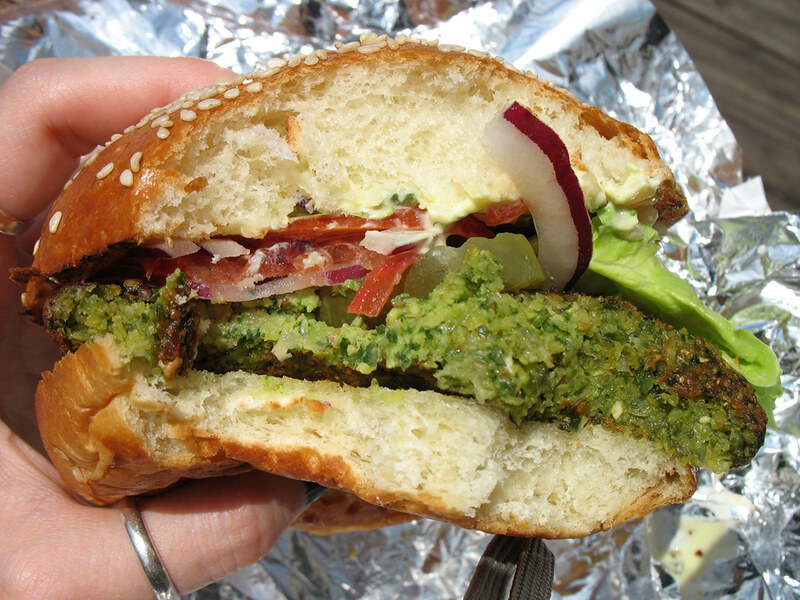 The Green Truck (greentruckonthego.com) serves a veggie burger called the Mother Trucker. I had it at the NYC Food Film Festival in June, review here. http://tinyurl.com/2bt28bd. They are mostly in the Hamptons during the summer, but do some festivals and fairs in the city too.